Miss Vermont travels across the state each year speaking about her platform and the Children’s Miracle Network Hospitals, working with civic and community groups, and doing charitable work. As an official Fueling Miss Vermont Sponsor, your organization sponsors a month of driving for our titleholders by providing Miss Vermont with a $200 gas card and Miss Vermont’s Outstanding Teen with a $150 gas card. During the month of your sponsorship, Miss Vermont will put your sponsorship on every travel-related social media post she makes. Schedule permitting, she will also prioritize an appearance at an event at your business during your month. Public exposure in different parts of the state every week and exposure to private organizations, civic organizations, families, schools, and at heavily attended Vermont tourism events. Messages on Facebook, Twitter, Instagram, Snapchat and in print identifying your organization as #FuelingMissVT for the month. The ability to have the titleholders attend a special event for your organization that month. 1 ticket to the Miss Vermont Competition for the coming year. A 1/4 page ad in our program book for competition. This scholarship is designed to ensure that Miss Vermont will be able to continue her studies at the college of her choice and pairs with a challenge to that university from our Executive Board for a fund match. The sponsor(s) of the Champion Scholarship present the award on stage at the Miss Vermont Competition and may invite the Miss to three events during the year to discuss her platform and share insights on the role of young women leaders in Vermont today. Scheduled events must be approved and not conflict with the two weeks at Miss America. The scholarship details will be on our website and in our program book with a bio of the donor or company. This scholarship is designed to allow a sponsor or donor to customize the scholarship to bear the name of the business or individual for whom it is being honored. The name of the scholarship may continue on indefinitely or annually change per the donor wish. The Miss or Teen recipient will attend two events during the year to discuss her platform and share insights on the role of young women leaders in Vermont today. The sponsor is invited to present the scholarship award in person on the Miss Vermont stage and will enjoy reserved seating. A description of the scholarship and donor will be in the program book for the annual show and on our website with a bio of the donor and the purpose of the scholarship that is being honored. This scholarship is designed to allow a sponsor to openly support the pursuit of Vermont’s young women in securing a college education to the winning Miss or Teen. This scholarship honors the partnership between the sponsor and the Miss Vermont Scholarship Organization. The Miss Vermont or Miss Vermont’s Outstanding Teen will attend on event of the sponsor’s choice during her year of service and the scholarship will be listed on our website and in our program book with a bio of the donor and honorary individual the scholarship is in the name of if desired. The sponsor may present the award in person on the Miss Vermont stage at our annual program and will enjoy reserve seating. 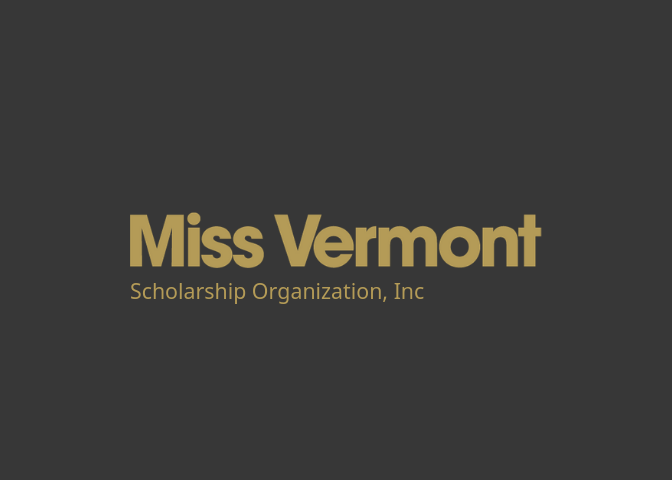 The Executive Board of the Miss Vermont Scholarship Organization is flexible and driven to help all our participants; all Miss Vermont and Miss Vermont Oustanding Teen contestants may be eligible to earn a scholarship to further their education. Scholarships can be offered for the Miss winner, the Teen winner, a runner up in either category, highest GPA, commitment to community service, or for any particular scholarship field your company has a unique interest in promoting. There are many ways for businesses and individuals to support the Miss Vermont Scholarship Organization. In addition to cash or scholarship sponsorship, there are many in-kind contributions that can support our program and our titleholders. To find out more about the benefits available please contact Sponsorship Coordinator, Alayna Westcom. All contributions to the MVSO are tax deductible as allowable by law donations as the MVSO is a 501(c)3 not for profit organization.